The education-industrial complex is a union of education organizations and government with a broad array of education industries. And as with our corrupted political process in general, money has become the dominate force in directing how our federal, state, and local education tax dollars are spent. But how deeply rooted is this rising “complex” and what does it mean for the U.S.? As with formation of the military-industrial complex, the rise of this self-perpetuating process is fed by greed, power, and for some, the illusion of reform. It has grown because of major public indifference towards educating someone else’s children plus confusion spawned by propaganda about the quality of public schools. The trick has been keeping us reaching for “higher” quality education as judged by the standards set by the complex itself. The problem produced is one the public knows as education “fads.” Industry experts and consultants have created, again and again, the next best tool to improve education and education vendors sell their products and services to those who most desperately want to do the best they can for their students — and now by law must prove they do. Much of the public has been convinced that “government schools” cannot provide better education than private industry schools at public expense — this is privatization of services driven by the education-industrial complex itself. The harm caused by this is lost instructional time — sometimes decades — as the public education system is constantly being jerked around directly as a result of harmful policy decisions influenced by education industry lobbyists. Should blame rest on the government schools or the government officials in charge? Or would the public be better served if we quit playing the blame game until we more completely understand the story behind the quality of American schools. Public schools are an institution dependent upon the ideals of a public trust —schools are accredited if they meet the quality standard. “The word accreditation is derived from the Latin credito (trust).” In 1871, “the University of Michigan began ‘accrediting’ secondary schools [high schools] entrusted with providing adequate preparation for university studies.” Over time, the process which had originated in a public university was handed over to regional non-profit accreditation associations. By 1940, these associations had completed a study (The Eight-Year Study or National Study of School Evaluation) and published the Secondary School Evaluation Criteria which served as “the instrument” for quality assurance and continuous improvement for our high schools. The Criteria was revised every ten years still following the basic findings of the original study. But in 1980, leaders with “postindustrial models of thought” changed our directives. By 1990, the basis of accreditation that had served our country well for 50 years ended with the last publication of the Criteria. So when you look at the corporate “partners” for organizations such as the Council of Chief State School Officers (CCSSO), it should not leave anyone wondering why these officials can’t or won’t make the time to hear what the people say their schools need; plenty of organizations are paying for their ears. The first corporation listed for CCSSO (at the time of this publication) is a multinational, private, non-profit accreditation company called AdvanEd. They have purchased CITA (The Commission on International and Trans-Regional Accreditation) as well as having the North Central, Northwest, and Southern Accreditation Commissions of the United States as divisions under their operations. I’m not saying these associations and corporations aren’t capable of doing some decent work; I’m saying our quality control of American education has been and continues to be out of the control of the American public. Is quality assurance now part of the Education –Industrial Complex? As Ronald R. Cowell president of the Education Policy and Leadership Center stated, “There’s nothing new about the idea of private companies’ being involved in education. What is relatively new is the degree to which private companies are involved with public-policy issues” and that is precisely what defines The Education-Industrial Complex; its influence over law assures its own success, not our children’s best shot at it. And in the end, we all pay the price for under-performing schools.In an article titled Today’s Education-Industrial Complex: Why aren’t schools an issue in the 2008 election? Paul E. Peterson writes, “Universities are finding it easier to recruit top-level scientists and sophisticated social scientists from abroad rather than try to grow them at home.” And the same thing is playing out in immigration “reform” law by making it easier for industries to import foreign highly-skilled workers so we don’t need to improve our own schools. 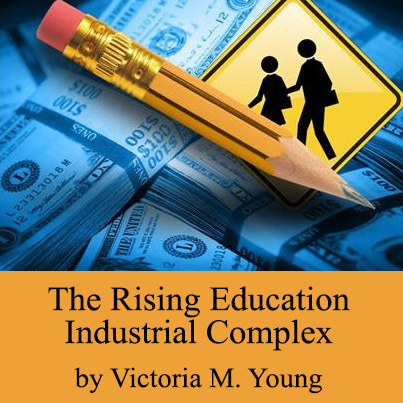 Some have recognized that the education-industrial complex exists; all of us need to come to see that reality. The accreditation of OUR “government schools” has lacked consistency and has excluded the public from its process or even knowledge of the basis for evaluations of schools. Are we to trust oversight of our schools to a nongovernmental, international agency? This is no passing fad. All of this was created systematically in the same way peaceful takeovers always occur. Americans have heart and deeply held beliefs that can be tapped into with the right words. Accountability (responsibility), flexibility, and choice (freedom, freedom) were the callings of No Child Left Behind (NCLB – ESEA) — a perfect title. But that single law not only directed dollars to testing, data collection, and private service industries, it also joined with the military-industrial complex by writing in access to student information for military recruiting purposes. The current Obama Blueprint for ESEA Re-authorization also has privatization written all over it – in code. Think privatization of our schools is the best way to go? What all this means for the U.S. depends on who we decide we can trust with the education of the masses. No Child Left Behind must be replaced. Who should govern our schools, how do we protect and serve our children, and how will we control the complex? By using what we know works for America —a balance of power with the ultimate authority resting with the people — the people can push for “the instrument” of continuous improvement to be resurrected and written into law, if that is their choice.